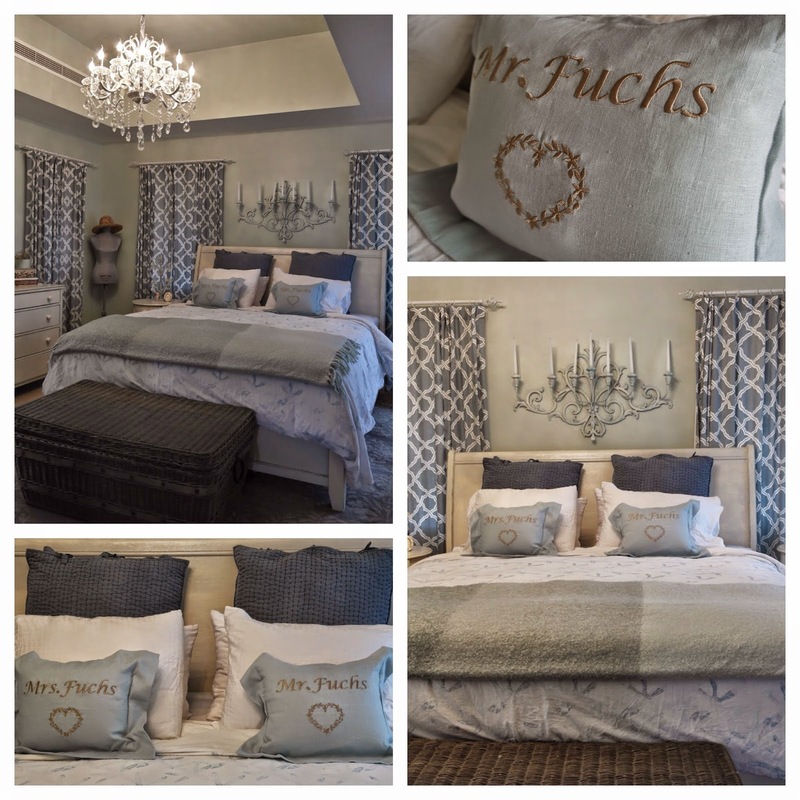 Personalized Pillows & A Tour Of My Room! Aren’t these new cushions in our bedroom so exquisite! I feel like they just tie my whole sleeping sanctuary together. I was always missing that “special something” on my bed. I would have a million pillows on it if I could! I just can’t handle the way my husband sleeps on them. He crushes them up and makes them all lumpy. One of my biggest pet peeves! I get a bit aggressive when I have to fluff them each morning haha. Grrr just thinking of it! These cute Mr & Mrs matching pillows are not something that I will need to get in a tiff over. They are decorative and he has been schooled that they are not to be slept on haha! They arrived wrapped in tissue with a beautiful blue satin ribbon tied around each one. There was a faint smell of a fresh room spray on them which I wish I knew where it was from:) Every so often I can smell it lingering in my room and it is just such a relaxing scent! The pillows are so crisp and the perfect shade of eggshell blue for my room. These handmade pillows are customizable. On the site you will notice the picture says “Mr & Mrs” but you can add in the family name (such as ours). I know…our last name is quite a laugh. It DOES mean fox in English though. Much better than my maiden name which felt like a rambling of letters randomly selected and squished together! Just because I am a nut when things are to be “just so” I must mention that the pillows are perfectly embroidered and centered! Great present for a newlywed, anniversary or birthday. They really are so elegant! Equally wonderful that they come from UAE too! No matter where we move in the future I will always keep these cushions and remember where they originated from and all the marvelous years we spent here in the gulf. Now on to the rest of my room which I thought I would finally share with you. Whenever my friends come over to visit they tell me what a wonderful job my husband and I did decorating it. Why thank you:) Nearly everything in our room has been upcycled or purchased for a real bargain! We had SO much fun putting our room together. 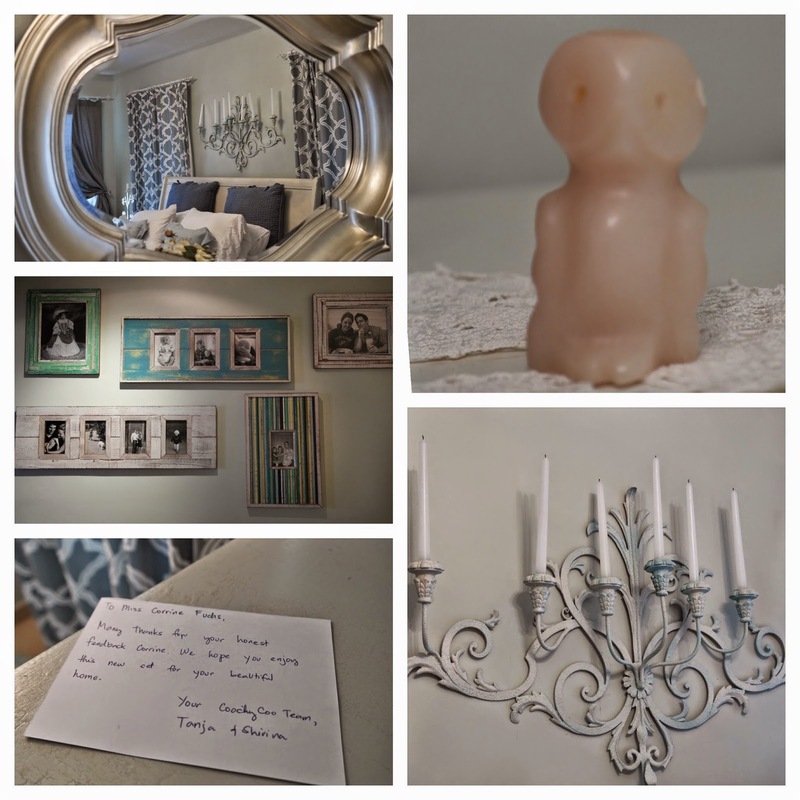 Each piece in our room represents a special memory. So let me begin! I knew I wanted this room in our new home to be relaxing and peaceful, somewhere where I could truly unwind after a long day of being on Mommy duties. The first step was our wall color. An interior designer friend came over and helped me go through colors. When she showed me the light sea moss blueish/greenish color I knew it was the one. My cousin who is a home decor TV fanatic told me to pick one color and use it to accent the room. We decided on eggshell blue. My favourite color! Our bedroom set which we had made by a carpenter was originally a dark mahogany/brown color. My husband so graciously spent one summer sanding the entire thing down and repainting it with a´pop of Tiffany blue peeking through. The room was already starting to come together at that point. Our next big step was to decide on window fittings. We had some white wooden shutters measured for our room from China Mall. 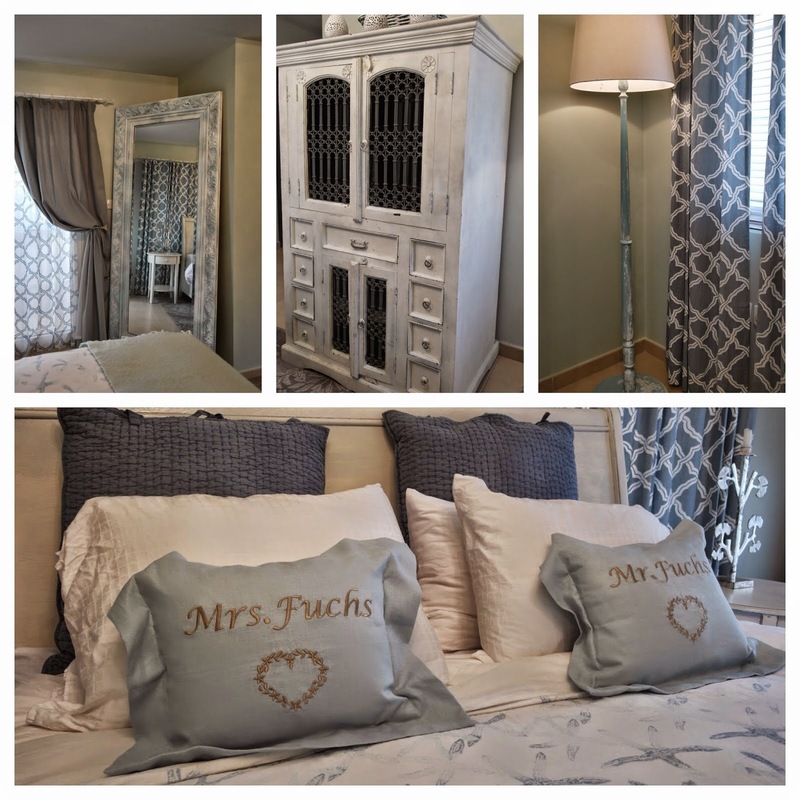 We then found the perfect trellis curtains and sheers from Pottery Barn. How lucky were we when we found them on sale! That same day we purchased our carpet which I just adore and the gold/silver mirror hanging over our dresser. The wall sconce above our bed is amazing. It was purchased last summer in Canada at an antique market. My husband removed all the wiring (it was previously used as a light fixture). We sprayed it and finished it off with fresh white candles. The set of rustic picture frames were purchased at the weekend market in Thailand. My sentimental owl comes from my best friend in Canada. She had it handmade for me in Muskoka, Ontario. Each day I look at it I think of her. The rest of the room were pieces we came across here and there. The TV armoire was a upcylced project found on Dubizzle and painted white. I love that the doors can be closed to hide the TV and keep the room looking clean and tidy. The antique Edwardian lamp was another find from Dubizzle. 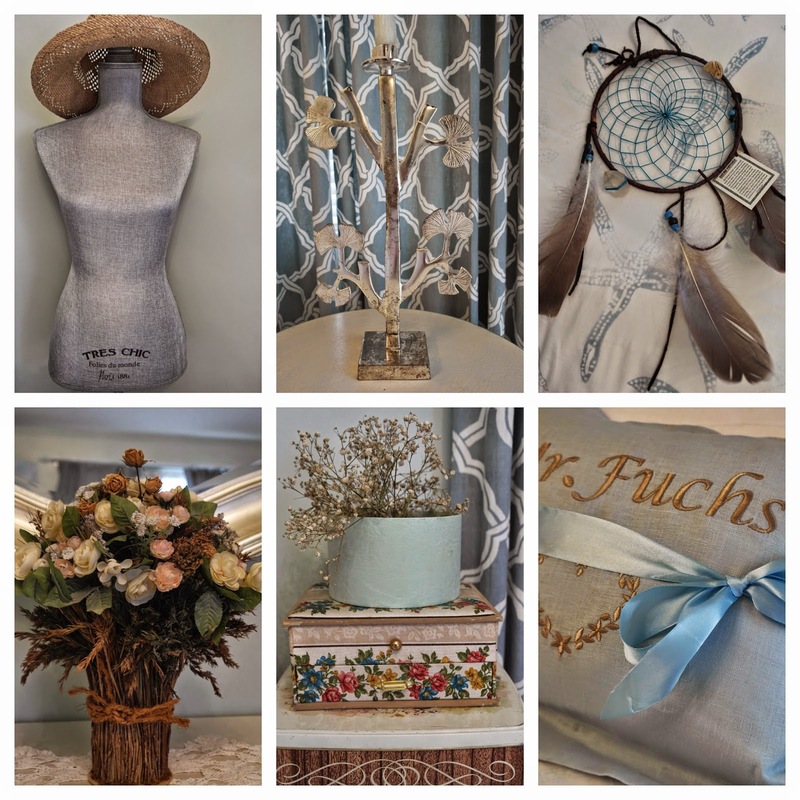 A couple in the Ranches had an entire house filled with antiques and were desperate to get rid of them quickly. I knew exactly what we would do with the lamp when we spotted it. I sanded it down and painted it Tiffany blue and off white with a crackle finish. The lampshade was from a neighbors home who purchased the wrong size and was throwing it out. The over sized picture frame was another trash find! Neighbor moved out and left it behind. I sprayed it again with Tiffany blue and white paint. So pleased with the way it turned out. The candle sticks was an old buy which was previously on our dining table in our last home. I like the look they give our room and it is always fun to light candles for that tranquil feel! The dream catcher was a gift from my Mom as she knows I really like Native Indian handmade crafts. I also am superstitious and like the idea of dream catchers and what they stand for:) It somehow makes me sleep better haha. It just goes to show you don’t need a ton of money to make your room a sacred place. Just a lot of patience (waiting to find the perfect items on sale, flea markets or Dubizzle). And then of course time to upcycle them.